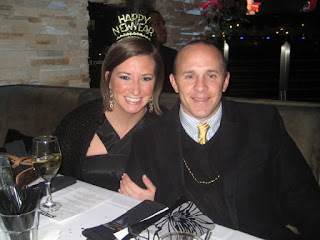 After weighing our options, C and I decided to ring in 2010 in the Windy City. We left bright and early on Thursday morning, looking for a good time in Chicago, which is only a 7.5ish hour car ride from here. In a flash of brilliance, C ordered a cookie cake for the trip. So picture me, in my Snuggie, eating some cookie cake, riding up the road - it was already a good trip before we even got there. We arrived in Chicago with time to spare, so we all took a nap before it was time to put our party clothes on. After two trips to Walgreen's to fix a pantyhose situation , we were set and ready to go. Our celebration was taking place at a bar called State. C's buddy Gary, who made his debut on this blog earlier in the year, knows the owner of this bar. We squeezed in with the group that had reserved a VIP booth. After trying on all the different Happy New Year crowns and hats - I chose the one with a feather - and taking lots of pictures in our 2010 glasses that C purchased us, we hit the dinner buffet. At midnight, yours truly poured the champagne for our table and we all counted down to midnight. 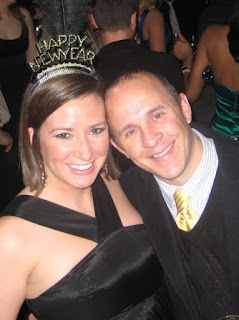 When the clock struck 2010, I got a New Year's kiss from the cutest man there, and then we celebrated the night away. And as if that wasn't enough, guess who went home in a stretch hummer limo? The vehicle, which was 100% passengerless and thus looking for business, offered us a deal. Since there were no cabs to be found, $10 a person and two miles later, we arrived home in style. We slept in Friday, hit up brunch, then C and I took a little side trip, which I'll tell you more about tomorrow... get excited! 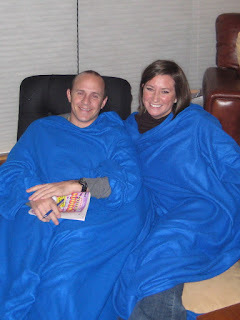 That night we dined on some AMAZING deep-dish pizza from a place called Pequod's and then watched a DVD at home. It was a low-key but great day. Saturday morning, we had one more amazing meal: breakfast at the original Lou Mitchell's, a famous diner that had a line out the door when we arrived. Holy crap, was it cold waiting in that line. Two of us (cough cough) may have elected to go wait in the car... but I digress. After some yummy fixings, it was time to head home. All in all, a great way to end 2009 and start 2010.